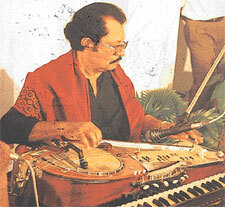 Dr. Lionel Algama, (Algama koralalage Lionel Kumaradasa Perera) the renowned, gifted and multifaceted Musician, Innovator of musical instruments, Teacher, Conductor and Composer of music passed away on the 18th of May 2008 nine years ago at the age of 74. He was a contemporary of famous musicians in the likes of legendary Dayananda Gunawardena, Premasiri Khemadasa and Pandit Amaradeva. 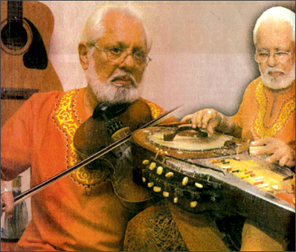 In addition he was an acclaimed ‘A’ grade singer, in Hindustani and Bengali as well, Examiner of music , ‘A’ grade Instrumentalist in ballet – stage – films – Tele-drama – Director, Conductor, Inventor of the original instrument called the ‘Soorthar’ and then the more sophisticated ‘Sree Veena’. He made an enthralling demonstration of the ‘Sree Veena’ as far back as 1979 at a musical recital at the Bharathiya Vidya Bhawan (UK Centre), an imminent institute of Indian Culture, London for an exclusive Brahmin music community. He successfully wrote two theses for his doctorate, the first of which was Teaching of Music and the other was Development of the Chordophones in East and West in the years 1978 and in 1979. The final perfected product of the “Sree Veena” was completed only in 1994 after making lots of research and perseverance. He had a knack for combining sounds and the ‘Sree Veena’ could which he invented could bring out the pooled sounds of several music instruments ,hence it could be utilized for a solo recital without any other musical instruments. He was a native of Siyane Korale in the Gampaha District who had his primary education at Veyangoda Central. His father, a wealthy businessman Jinadasa Perera, owned a theatrical company essentially for amateurs. It was a routine each evening for artistes to conduct rehearsals at their residence. Having identified his talents and interest in this creative field at his tender age of 20 years in 1955, his father a person of substantial means sent him to Visva Bharathi University, West Bengal, Shantiniketan to complete a degree in Music. Having studied Bengali and Hindustani he had become an important member of the broadcasting team of the University as an instrumentalist during the tenure of his course. As he grew in stature as a musician he evolved with time, his own distinctive inimitable styles of composing music for Ballet, Tele-drama, Stage plays and Films. He was always interested in experimenting with sounds and instruments. Eventually, he invented the ‘Soothar’ which as basically the blending of sounds produced by Sithar, Hawaiian guitar, Sarod, Santoor, Harp and Goothawadyam. 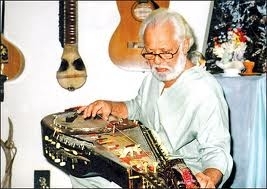 Besides his own “Soothar” he has mastered the Sithar, Sarod, Harmonium, Piano, Organ, Mendolin, Tennor, Banjo, Guitar, Esraj, Torshani, Santoor, Violin and Tablano which no other musician in Sri Lanka is so competent who could have challenged him. Even today it is intricate for any famed musician to live up to his standards in playing such a range of musical instruments. He was a gifted and the best innovator Sri Lanka had ever produced, It is unfortunate that his contribution to the field of music had not been agreed for due recognition by the administrators in Aesthetic music, He excelled at classical and jazz concerts and Ballets in New Delhi, Calcutta, Bombay, Benares, Jaipur and Pakistan between the years 1955 to 1959.These recitals were applauded, hailed and appreciated by numerous types of audiences. Subsequently he performed at Perth and Tasmania in Australia with the Chitrasena Ballet troupe, Broadcasting and T.V. Singapore in 1963. Between 1979– 1980 he performed for B.B.C. London, I.T.V. London, Manchester, Birmingham Camden Centre London, W.C.I., Commonwealth Institute of London, Bharathiya Vidya Bhawan (U.K.centre) Institute of Indian Culture London also toured all the Scandinavian countries for musical recitals and concerts. He recollects his performance at the Bharathiya Vidya Bhawan Institute of Indian Culture, London, a jealously guarded aristocratic preserve of high caste Indian Brahmin. He was incidentally requested to perform before the institute’s Board of Directors and was allowed to perform only after passing a rehearsal. The performance was for charity which had fascinated the audience by keeping them spellbound. From 1959 to 1989 he worked as a music teacher on a long stint at Thurstan College, Colombo as the teacher of music. He created the College theme song. President Mahinda Rajapaksa was a pupil of his and during the time of his brief illness had instructed all hospital authorities to give his mentor all necessary care and attention. The College theme song composed by this genius musician which still exist. In 1975 he was appointed as a Cultural Development Officer in the Ministry of Cultural Affairs. He was also entrusted with the duties as the chief Examiner of Music, in both theory and practical at the Faculty of Aesthetic Education, University of Kelaniya. He served as a supervisor in music, Ministry of Education in the Republic of Maldives from 1983 to 1984. He was entrusted to design the North Indian Classical music syllabus for the Institute of Asian Culture, University of Windsor, Sunset Avenue, Ontario, Canada. He has composed and directed music in several films, ballets, dramas produced in Sri Lanka and won awards for the Best Music directions in 1961, 1963, 1966, 1976, 1984, 1996 and 2000. The first of many films in which he made the music score was in the film “Patachara’ He was the winner of the National award for the Best Music Directions and Creations in 1995 and also won the best Tele-drama Music Directors Award in 2000. The musical score and composition of the award winning film “Parasathumal” produced by Chitra Balasuriya was also his. He composed music the main theme song sung by Sujatha Attanayaka, “Parawuna malwala suwanda athethe” , which was also an award winning song’. The other films he directed the music were ‘Banduramal’, ‘Pradeepaya Mawewa’,’Mayurige Kathawa’, ‘Bambara Geethaya’ and ‘Vasanthi’ etc. Altogether he had directed music in 09 films. He had composed music for a number of stage plays such as Dayananda Gunawardena’s “Naribena, Romeo and Juliet, Sinahawa, Nuwana Podiya, Tikirimalie, Oedipus, Kusa Pabawathie, and the Horror of Mahahena.” He also directed music for ballets, Karadiya, Nala Damayanthi, Sakunika, Ginihora, Rankikily, Kinkini Kolama, Capture, Isolation, Making of Men, Through the Desert and Macbeth. In addition he has composed, organized and conducted music for several feature programs in Hindustani, Classical and Light music. He performed his new instrument “Sree Veena” in a solo concert at Elphinstone Theatre, Maradana on January 7th 1996. Professor of Music, University of Delhi Ajit Singh Paintal was the chief guest had this to say.’ The “Sree Veena innovated by Algama had unique sound quality of many Indian instruments like Sarod, Sitar and Swar-Mandal all combined together into a solo instrument. Algama’s performance marked with highly skilled technique with his aptitude in several Indian and Western musical instruments. It is a unique experience to listen to Algama playing on Sree Veena,the Indian Ragas with such depth. Dr. Lionel Algama celebrated his 70th birthday on 24 March, 2005. To commemorate the golden jubilee of his musical career it was his intention to celebrate the occasion with a solo music recital with the aid of his invention, the Sree Veena. Unfortunately due to the tsunami catastrophe, he was compelled to postpone the event without any hesitation. In the above context his loss is irreparable to all musicians, music lovers and his numerous pupils. May his life through sansara be shortened until he attains the supreme bliss of Nibbana.